Pro Lac Pro · Line is a strong fixing lacquer without gas to provide an extra fixing in your hairstyles and contribute, with its antioxidant properties and its advanced UV sunscreen, to a greater care of the hair. The Pro Lac fixative formula provides cotton stem cells that protect against external attacks on both the hair fiber and the scalp. Pro Lac will allow a fixing with anti-humidity effect and active for the conservation of color. 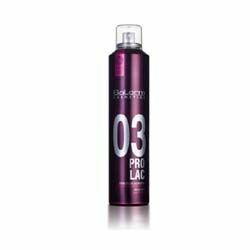 Apply Pro Lac to dry hair about 30 cm. A progressive action, humidity resistant, non-aerosol hairspray with active color-preserving properties. Cotton stem cell extract creates an anti-oxidant effect. Contains a sun-protection filter.